NORTH SHORE, Oahu/Hawaii – (Thursday, November 3, 2016) — Opening day at the Vans Presents the HIC Pro saw massive waves coupled with the homecoming of world champ John John Florence at Sunset Beach. The North Shore was abuzz with his anticipated arrival which coincided with one of the biggest swells of the season. 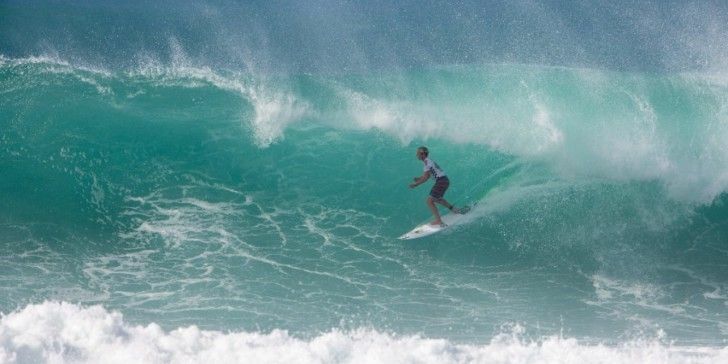 It was a classic kick-off for the World Surf League (WSL) Qualifying Series (QS) 3,000 event, the official local qualifying competition for the Vans Triple Crown. Florence did a drive by of the HIC Pro event site as his final stop of a celebratory homecoming that included his alma mater Sunset Elementary School. He stuck around to watch brother Nathan Florence compete in Round 2. While Nathan’s campaign was cut short, top names like Sunny Garcia, Evan Valiere and Makuakai Rothman got one step closer to the podium and a sought-after slot into the Vans Triple Crown of Surfing. Garcia’s power surfing bode well for him in the solid 12+ foot conditions as he and heat winner Gavin Gillette (HAW) traded waves, but Kauai’s Gillette proved to be more inform after he secured the highest wave score of the day, an 8.17. The mid to high range scores throughout the day proved the difference in today’s challenging surf. Kauai was represented well today as Evan Valiere, Alex Smith and Dylan Goodalealso advanced in first place to compete again in Round 3. Valiere tied Gillette for the best wave score of the day, an 8.17, with critical positioning on a set wave. Also advancing in second place is Kekoa Cazimero of Honolulu, who bested Saxon Lumsden (AUS) and Schuyler Allen (HAW). A handful of Tahiti athletes, who now surf under the WSL Hawaii/Tahiti Nui region, saw success at the big wave venue including Tereva David, Taumata Puhetini, O’Neill Massin. Finn McGill, the youngest competitor in the HIC Pro, dropped the highest single wave score, a 9.4, and combined heat total, 17.40. McGill, 16, grew up surfing Sunset and has been taught and supported by some of the industry’s best. He is working this season to qualify for the Vans Triple Crown, where he will be the youngest surfer in the series. Another standout junior, Noa Mizuno, advanced from Round 2 to continue his victorious winter campaign after placing first in the final Junior QS event of the season, the Turtle Bay Resort Pro Junior, and earning a spot in the World Junior Championship in Australia this January. Mizuno also holds the Regional WSL Hawaii Junior Champion title and will be focusing his fulltime attention on competitive surfing once he graduates from Punahou School next year. Surfline, official surf forecasters, predict 8-12ft+ waves tomorrow, as the old pulse of NNW swell fades and a fresh NNW energy pushes into the lineup, with occasional bigger sets for standouts over the afternoon. Contest organizers will reconvene tomorrow morning and make a call by 7am. Tune in to watch the HIC Pro, Presented by Vans LIVE on WorldSurfLeague.com and VansTripleCrownofSurfing.com/Vans. Hawaii’s biggest and best selection of surf gear – since 1971 HIC has provided Hawaii with quality surfboards, skateboards, clothing and accessories – by surfers, for surfers. Locally owned and operated, the HIC retail chain includes fifteen stores across Oahu, Maui and the Big Island, plus two in Japan. Through a commitment to quality, service and aloha spirit, the brand has built a reputation as an icon of Hawaiian surfing recognized throughout the world. Enjoy the ride! Official HIC PRO event gear available at hicsurf.com! Vans®, a VF Corporation (NYSE: VFC) brand, is the original action sports footwear, apparel and accessories brand.Vans authentic collections are sold globally in more than 75 countries through a network of subsidiaries, distributors and international offices. Vans also owns and operates nearly 600 retail locations around the world. The Vans brand promotes the action sports lifestyle, youth culture and creative self-expression through the support of athletes, musicians and artists and through progressive events and platforms such as the Vans Triple Crown of Surfing®, the Vans U.S. Open of Surfing, Vans Pool Party, Vans Custom Culture, Vans Warped Tour®, and Vans’ cultural hub and international music venue, the House of Vans.